Having a one-income household can be hard sometimes. It’s a choice and a sacrifice. Even though we have decided this for our families, it’s nice to be able to bring in some extra income. 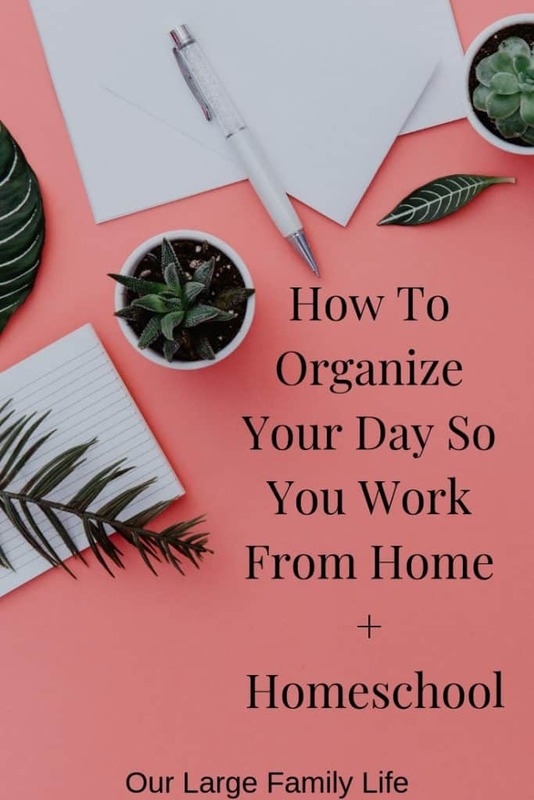 Whether you have a job and you’d love to find something you can replace your income with or you are looking to supplement, working from home is definitely possible even with a large family when you homeschool. The first thing you need to decide is whether you want a work from home job or if you want to start your own business. You can check out a full break down of the difference between a work at home job and home business. The thing to consider here is how it will affect is your schedule. If you are looking for a work at home job with a company they will most likely dictate when you will need to work. If this is the case then you will know what hours you need to be available and schedule your other commitments accordingly. If you opt for a business, then you have a little more freedom to decide what kind of hours you want to work, depending on the type of business you start. When starting to put your schedule together, list out all the important time commitments you have. Homeschooling, church, extracurricular, doctor appointments, volunteering, anything that you give your time to during the week. This allows you to see the big picture before you start arranging your week. Start putting together your days by the most important and inflexible pieces. Homeschooling is going to be your number one priority, but it can also be done at any point during your day that isn’t fixed. Any outside activities, (church, sports) will most likely be a fixed time so they will have to go in those time slots. If you have a work from home job that has set hours during the day you will need to fill in that place as well. If you have a job or business that you can do any time then you can look for places to block off time for it. After you have put everything into place, it’s time to take an honest look. I know we moms like to be super moms, scheduling down to the last minutes of our day but reality needs to take over here. Every minute of our days can’t be scheduled because something will always pop up to interfere. Life with kids is messy which means schedules can be messy as well. That doctor appointment may take an hour and a half instead of just an hour. Your kids aren’t going to know where their shoes are when it’s time to go to sports even though you reminded them a half hour ago and they said their shoes were on. It’s very important to make sure you have a buffer time between activities. So are things too crowded? If not, great! If they are, try moving things around to see if they can fit better and give you some more space. Of course, if your schedule is too full and everything doesn’t fit, you will have to start cutting things out. For me I have found the best times for working are before kids wake up and after they fall asleep. These are my most productive times because I can be solely focused on work and not attending to everyone’s needs. I do work while the kids are awake as well, but I save work that can be interrupted and continued easily. When I have stuff that needs total attention, that’s best left to when they are asleep or when my husband is home to help them. Since we already of limited time in our days when we homeschool, it’s so important to guard your time and cut out distractions. Facebook, housework, phone calls, email, anything that is going to pull you away from concentrating needs to be taken care of. Adding working from home to your schedule is a big undertaking. And not one that you should do alone. Again, we are not going for super mom right now. So if there are things on your plate that you can give to someone else, do it. Have your kids help out with chores more. If they are old enough to cook, have them make some simple meals so you are not on meal duty all the time. Assign daily chores to everyone. Our kids have chores that they do every day. This makes it easy to keep them on task and make sure the house gets some attention every day. Ask your husband if there are some household tasks that he can take over. Even one thing that he can take over so you can have some focus work time will be helpful. This is always the hardest. If you find that your schedule is too full and you have delegated what you can, it’s time to start cutting things out. If making money from home is going to be a priority, then it means you will have to cut back on other things. It could be the kids doing fewer activities, and less outside commitments for you. At this point, I think very carefully before we commit to anything because I know the more things we join in on, the less time I will have to work. I find if I view things in a 5 or 10-year lens, a lot of things that seem important really are not. They feel important now, but I know it won’t have mattered as much down the road, especially compared to what I’m trying to accomplish with my business. Another thing to think about is that no now does not mean no always. If you want to bring in extra income to help with a short term financial goal, you will have more time to free up when those goals are met. You could then cut back on working hours and commit to more outside activities. Once you know what activities need to go on your calendar, it’s time to fit them into place. If you don’t have too many activities that have different time changes every week, I highly suggest developing a routine that can remain close to the same most of the time. This will help you to know that everything will get done, and won’t leave you scrambling. It will also help the kids to know what to know how their days are going to flow and to know what to expect. If you are going to delegate chores to your kids to get done, having a routine will help them to remember without you having to remind them every day. Working from home and homeschooling is totally possible. Yes, your days will be busy, but if this is your goal you can make it work with a little planning. Start by figuring out what all your time commitments are and how many hours you want to work. The next step is to figure out what tasks around the house you can have someone else do. Cut out any activities that aren’t important for right now. Lastly, develop your new daily routine for homeschooling and working. Of course, your routine won’t be perfect on your first try. It will take testing and tweaking until you find a way to make it work for you. What are your best tips for organizing your day?